Once a year, the Flagler Museum in Palm Beach celebrates its anniversary by opening to the public free of charge in honor of Henry Morrison Flagler and his granddaughter, Jean Flagler Matthews, who rescued the estate from demolition in 1959. This year, Founderâs Day falls on Sunday, June 5 (noon-5:00 pm.) and admission is free. Flagler impacted modern Florida like no other private citizen in the history of the state. At the time of his death in 1913, his wealth from business ventures such as being a founding partner of Standard Oil was almost unimaginable. While he lived as lavishly as any other Gilded Age captain of industry, Flagler was also a philanthropist. âI have come to the conclusion that the best way to help others is to help them help themselves,â said Flagler, who generously donated land for schools, churches, hospitals and libraries throughout Florida. His endowments and trusts are still valued at more than one billion dollars, which supports various educational, charitable and cultural programs. His estate, Whitehall, was built in 1902 to demonstrate the nationâs rise to the pinnacle of human invention and artistic achievement. 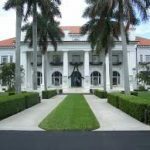 Now a National Historic Landmark, Whitehall is an architectural treasure filled with a collection of art and objects related to the Gilded Age and special exhibits on Florida history. In the adjoining pavilion, you will find Flaglerâs private railcar. Whitehall is located at One Whitehall Way in Palm Beach.